In TV land, the back-to-school season rolls out over two months. In some parts of the country, school starts in late July, while others open their doors after Labor Day. And college students, of course, start planning their dorm rooms soon after school gets out in the spring. As a result, I kick off my back-to-school segments right after the Fourth of July, and continue until late August. 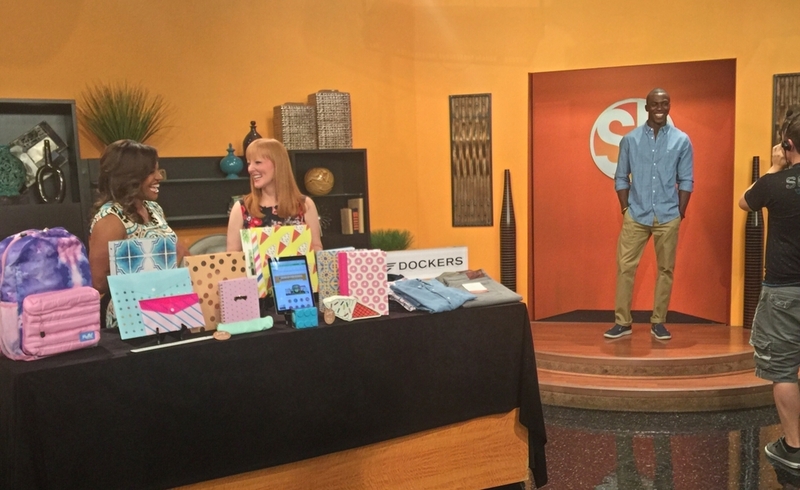 I wrapped up my tour of almost two dozen segments this week with a visit to "Studio 10 Live" on WTSP-TV, CBS, Tampa to show the latest fall looks on behalf of Dockers and cute new school supplies for Office Depot. As someone who is 5'7" and almost always wears heels, I rarely feel short, but next to co-host (and former Tampa Bay Buc) Michael Clayton and our tall models - well, I spent the morning looking up to a lot of people. Tune in below to watch the full segment! When it comes to buying clothes for back-to-school, college guys and teachers usually get left out of the conversation. But hey - they need clothes too! So, I am excited to be working with Dockers this season to show some of their latest looks for fall. And working with super-nice models and wardrobe stylists across the country isn't such a bad thing, either. One thing I love about their clothes is that they are always on-trend, without being trendy. They are also my husband's style, and of course, he is just my style. Jean-Cut Khakis have traditional five-pocket styling. They also have just a little bit of stretch in them to make them more comfortable - a feature us girls have appreciated in our clothes for years. These Clean Khakis have a classic, tailored fit. Nice to have if you need something dressier for a dinner or event after class; just toss on a blazer and you're good to go. For guys who like their khakis to have a more vintage, lived-in feel, these Broken In Alpha Khakis are awesome - and the models report they are super-comfortable! Models Chad, Jeff and Titus on the "Sonoran Living" show. Bonus: these khakis are also super-affordable, at $50 to $58 per pair. If you're like me, and mentally calculate cost-per-wear on some of your clothes - you'll get a lot of mileage out of these. These are quality khakis that last; not "fast-fashion" clothes that start to fall apart after you wash them a few times. You can take a look at all three of these styles - and, of course, watch our models do their thing - in this segment on the "Sonoran Living" show in Phoenix.